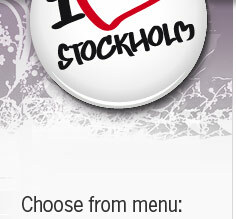 In stockholm you will find a lot of shopping in different stores around town. You will find most of the big chains and shopping centers to vintage stores and many other shops that you will not find anywhere else than right here in Stockholm. Martin E-type Eriksson has made a success with his restaurant Aifur Pub & Bar on Västerlånggatan 68 in Old Town with its Viking theme. 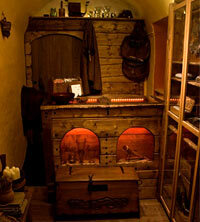 Now he has also opened the shop Aifur Plunder, also with the same theme - Vikings. Many guests at Aifur have asked where they can get hold of, for example, cutlery and glassware available on Aifur Pub & Bar. So the store Aifur Plunder sell both historic crafts and jewelry from the Viking Age and decoration that can be found in the restaurant Aifur Pub & Bar. Many of the beautiful Viking jewelery are exact copies of the findings that have been found from the Viking era. Many items can be viewed in the original at the History Museum. The jewelery is primarily made of bronze and silver. Beyond Retro is a vintage store chain originating in London. Their goal is to recycle used clothing and make those available to all. They want to try to reduce the mountain of clothes that are thrown away each year and therefore invest in retro clothing. They have a strict policy to never buy or sell new fur garments. However, they sell old worn fur and leather goods. Beyond Retro buys its clothes from charity organizations, making their payment going back to charity. Beyond Retro wants to get rid of the wear-and-throw-away fashion. Old Town is like a small city in the middle of the big city. It feels like you are walking back in time among houses from 1600 and the 1700s. The streets are narrow and filled with shops, cafés and restaurants. Here you will find shops selling antiques, toys, art, porcelain, furniture, watches and clothes etc. On Västerlånggatan you will find many tourist shops full of souvenirs. So just wander around here and peek into the various stores. During Christmas time you can visit the Christmas Market at Stortorget in Old Town. Here vendors gather and sells everything from Christmas decorations to sausages and fish. 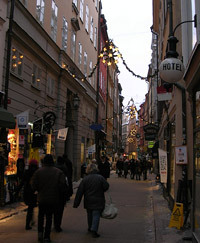 Shops that can be found in the Old Town is among other: Butik Sirlig, Kristallrummet, Ewa i Walla, Handfaste, SiFi-Book store and Second handbutiken among others. Västerlånggatan, Köpmangatan, Stortorget, Stora Nygatan among others. PUB opened Dec 1 1925. 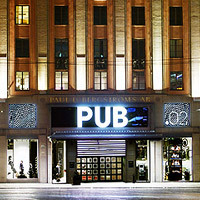 PUB was founded by businessman Paul U Bergström, who opened a small shop in 1882. That store was near where today's PUB is located. Here he sold ready-made clothes in different sizes and at fixed prices, here you didn´t bargain. One of Sweden's most famous actress Greta Garbo became employed here in the 20's as a shop assistant and she was also a model in PUB´s commercial films. This was the beginning of her career. Inside the store you will find different shops and brands: Himla, House Doctor, The Shirt Factory , Acne, Hugo Boss, WeSC, Filippa K, Gant, Tiger of Sweden, Twilfit, Hallbergs Guld, Team Sportia among others. A new Scandic Hotel (Scandic Haymarket) will open in the PUB-building in the future. So currently, some stores have moved out of the PUB-building. We are looking into what stores that remain and will return with information as soon as we receive that information. Here you will find around 4000 products with specific focus on organic, fair trade and biodynamic goods. You can buy organic hair care, milk, bread, baby bottles, vitamins, detergents, chocolates and dinner food. Gryningen opened in the mid 80s. They also give advice and tips on organic products. 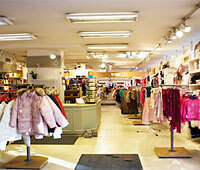 The shop with children and youth clothing from 0-18 years old. 250 sqm area to shop at. Clothes for everyday, parties and rainy weather. You will find designer clothes from the usual to the more trendy. The store is divided for boy / girl and by age. It makes it easy to find your way around the store! Classic trendy shoes for men with a passion for shoes. 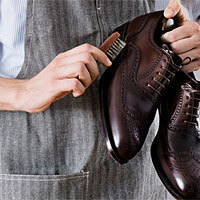 Here you can find shoes and boots from England, Italy and Spain. All the shoes are quality assured. Here you can find that exclusive shoe from Rome, New York, Paris or Milan. Many top brands under one roof. Those of you who want to indulge yourself in shoes has come to the right place. Brands from Jimmy Choo, Manolo Blahnik, Balmain, Stella Mc Cartney and Salvatore Ferragamo among others. For those of you who love street fashion and want to find very many different brands. You've come to the right place if you visit this shop on Sveavägen in Stockholjm. Brands like Solid, Superdry, New Era, Canada Goose, Depalma and Mood etc. Both for the younger and older. 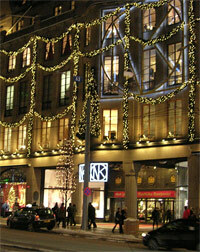 NK is probably Stockholm most famous department store. On September 22, 1915 the department store opened its doors at Hamngatan, but NK was founded in 1902 by Josef Sachs. He was also the department store's CEO from 1915 to 1937. NK was also the first in Stockholm to have an escalator. NK's logo is still the same as when NK was founded in 1902. Since 1964 the logo sit together with a clock on the store's roof where it shines in neon light. The clock has been around since 1939 when it sat on the Stockholm Phone tower which is now demolished. It´s also said that NK had Sweden's first outdoor neon sign in 1924. Greta Garbo has also been a model here. NK offers the latest fashions and exclusive products just like when they opened in 1915. NK is also known for being the first with many new stuff. For example, NK was the first to introduce the Barbie doll during Christmas 1962. Speaking of Christmas, this is the place for checking out the store windows during Christmas when the Christmas theme is revealed to many curious visitors. Inside the department store you will find shops and brands like: Kookai, Tara Jarmon, Nicole Farhi, LIVLY, MD Formulations, Armani, Filippa K, J. Lindeberg, Marc O'Polo, Ralph Lauren, Tommy Hilfiger and many many more. 1971 NK opened it´s second store in Göteborg. 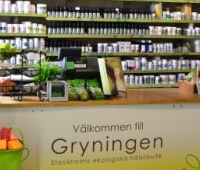 The stores in the area Sofo at Södermalm is open some extra hours in the evening once a month. The concept has become very popular. During these evenings yoy are usually also offered special discounts and other offers. Folkungagatan. These abbreviations are typical in areas you find on Manhattan in New York. As the concept of having open later one evening a month becoming so popular the shops at Kungsholmen have now done the same. The area is called WoHa - West of Hantverkargatan. WOHA you will find on the streets around Scheelegatan.